Recovering Working Mom: Truth or dare . . . do you want s'more?! 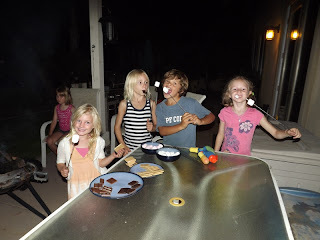 Today family fun had two parts – Daddy’s part in the morning where he took the children to Nickel City until about 2:30 so that mommy could get some things finished and mommy’s part in the evening where we planned backyard s’mores. I do have to commend my husband for being such a good sport about family fun. Usually I pull these things out of my @$& with an hour’s notice. Superego (our oldest child) had a friend over and then we had friends join us for dinner at a local Mexican food restaurant (Miguel’s for all of you locals); we figured four adults, five kids, we can do this, right?! 1) When your husband takes your children out of the house for several hours, be sure that you can plan it so that during the time he is away with the children you are not at the Vet and the Pet store dealing with your dog who apparently has fleas. I found out Dexter had fleas and needed to get him treated pretty quickly. So, of course, while my kids were out of the house so I could take care of some business at home, I wasn’t at home! Luckily we did get him and the house treated, and it seems to be ok now. 2) Some things never change . . . you should not be surprised that when you have children going into the 4th grade and they are of different genders, somehow, truth or dare will come up; when you hear the phrase “I dare you to kiss someone at this table”, and the odds are 1 boy with 4 girls (one of whom happens to be your 4 year old who already tries to wear make-up and tells you she has 5 boyfriends), you’d better ask for the check quickly and get out of there. 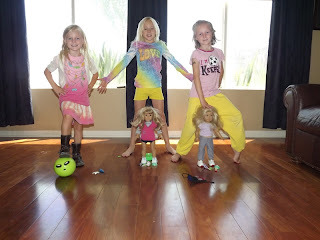 As my husband pointed out, we should be glad that they are still playing that game in front of us, but when they started asking the parents “truth or dare” and the truths were “Have you ever kissed a girl other than mommy”, we knew we were in trouble! I also knew we may have had a problem when Id (the baby) was licking a palm tree. 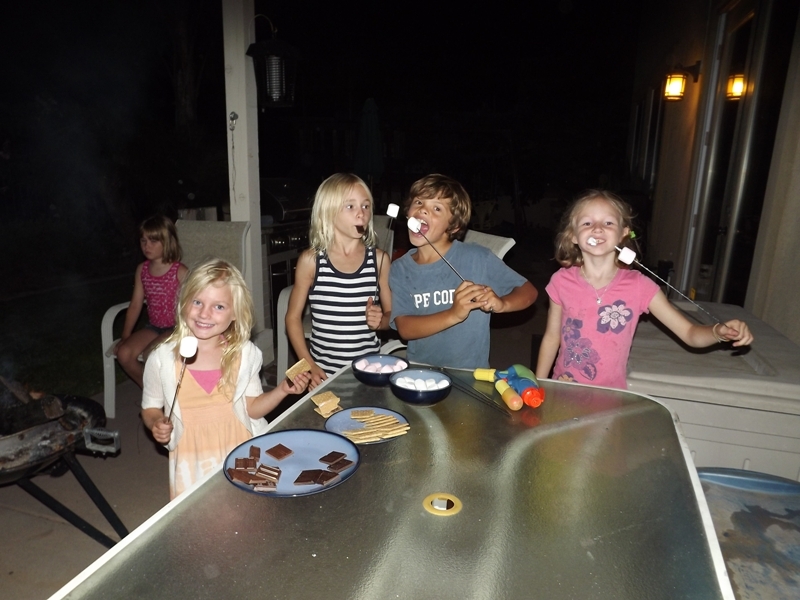 3) When making backyard s’mores, be sure to close the windows to your bedroom because the fire that you just made downstairs to cook the s’mores will end up making your house smell like campfire. My husband, of course, is in heaven because it reminds him of home in Colorado. All I can think about is the smell I’m going to have to wash out of my sheets the next day! Dark Chocolate with your s’mores and strawberry marshmallows. My husband wasn’t crazy about the strawberry, but the rest of us agreed . . . you put a little of that melted dark chocolate with it, and it’s really good. Miguels for dinner out with friends. Good food, good drinks and reasonably priced. It’s an old neighborhood standby. You may want to ask them to put you and your children in an enclosed room, or outside so that no one notices the noise coming from your table, or the “truths and dares”. Having your husband take the kiddos out for some play time at Nickel City. The kids have never been so excited about all the prizes they won.